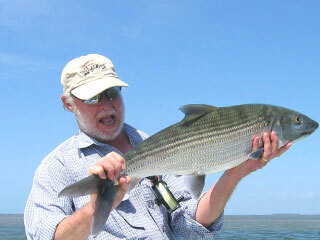 Favorite Fish: Florida Keys magnificent tailing bonefish and a laid-up tarpon. Two Favorite Saltwater Flies: #4 Lead Eye Merkin Crab, cream and tan. Same in brown and tan. Soon After arriving in South Florida those concerns were quelled when he had the good fortune to meet Flip Pallot, Steve Huff, and Chico Fernandez, all of whom introduced him to the wonders of South Florida, the Keys and Everglades. For Sandy, sight fishing for bonefish, tarpon, snook, and redfish was an incredibly rewarding challenge. Tournament participation provided a chance to focus on specific species. He was able to learn and share knowledge with many of the sport’s finest anglers and guides. During those times Sandy was Grand Champion of the Keys’ most prestigious fly tournaments eight times. After selling a successful business in Miami in 1985 he moved to Islamorada full time and was a frequent guest on the Walker’s Cay Chronicles, The Reel Guys, and Andy Mill’s Sportsman’s Adventures. By then he had released well over 100 permit on fly. Sandy has fished and explored throughout the Caribbean, Bahamas, Central America, the Seychelles, Christmas Island and Palau. He was among the first US anglers to fish for Atlantic salmon on Russia’s Kola Peninsula before Perestroika. After attending a saltwater fly-fishing seminar in the Everglades, Sandy invited his friends to join in teaching a school he would base in Islamorada. The Florida Keys Fly Fishing School had its first class in 1989 and recently reached its 30-year mark for world class instruction. The school eventually led to opening the premiere salt water fly shop in Islamorada Florida Keys Outfitters. Sandy was past president of the Everglades Protection Association and served on the East Everglades/Everglades National Park Advisory Board at the appointment of Governor Bob Graham. He is a founding member of Bonefish & Tarpon Trust, and past Chairman of The Don Hawley Foundation (Guides Trust Foundation). In 2018, Sandy was awarded the Fly Fisherman Magazine – Sage Conservationist of the Year and presented with The Orvis Company Lifetime Achievement Award for his work with the Now or Neverglades Movement. He is on the Board of Directors for The Bonefish & Tarpon Trust and Bullsugar.org.